How to Travel with little or no money? The original idea was to get free board and lodging in return for a few hours work on the farm. The emphasis was no longer just on farm work, a host could offer any kind of work including childcare, hostal and hotel work, construction, house sitting, office work etc. Workaway suggests that there should be around 5 hours of work per day, five days per week in return to board and lodging. This is very flexible and the host can offer any combination of requirements. By the way. Another thing to take into account is that volunteering could be an excellent way of learning a language. If you spend two months on a farm in France where there are no English speakers your French is going to improve a lot more than if you had spent a lot of money on a French course. I have spoken to lots of people who have done this type of volunteer work all around the world. These sites offer a really good way of having interesting experiences without spending much or any money but it is not for everyone. There are a very wide range of possibilities. On the one hand some places are commercial companies using volunteers as cheap labour in a cynical exploitation where they really ought to be paying people to the other extreme where the volunteers are pampered, given gourmet food and treated like welcome guests. Don’t get me wrong, I am not dividing them up into goodies and baddies. I have spoken to people have had a wonderful time being cynically exploited, for example, working in a backpacker’s hostal in a city centre or working in a large group on a farm where there is a good social life. The moment people hear about workaway they immediately realise that they can get work done for free. This can atract the wrong people. The worst form of exploitation I have heard about is probably childcare, the minimum form of renumeration for childcare is aupairing where the childcarer is guaranteed at least a separate bedroom from the child and some time off. There are plenty of workaway hosts looking for gullible suckers to look after their children for free where it is necesary to share a bedroom with the child. One thing to be aware of is that if you are doing volunteer work you have to take responibility for your own safety. Make sure that all ladders are in good condition, you wear safety glasses and don’t take any risks with machinery. Many people don’t know that concrete is very corrosive and if any gets into you boots it can cause serious burns. A volunteering experience should be about a symbiosis between the host and the volunteer with both sides beleiving that they are getting a good deal. Many of the volunteer hosts are involved in some sort of alternative lifestyle and you will often hear words such as permaculture, gardening, yoga, vegetarian, alternative building methods, spiritual, house renovation, solar power etc. 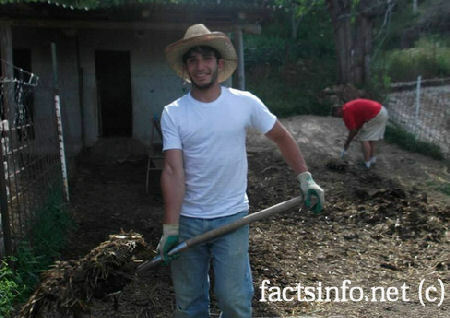 There are also a lot of places offering accommodation such as bed and breakfasts who need help with the chores. All of the websites showing host information show feedback left by previous workers so bad places will quickly be rooted out. If you are thinking of doing volunteer work this is the advice I would give. Read the information very thoroughly. Make sure that if you are a facebook junkie that the host has a good internet connection. If you don’t like being in the middle of nowhere choose a place near a town. Be very honest when you write your profile. Make sure you understand exactly how many hours per day and how many days per week you are expected to work and if you don’t agree don’t go there. Ask what you need to bring. If you are lazy and hate working don’t volunteer as a worker. There is another site which I have found the other day. It is for people looking for house sitters, some of them have pets. Also homeowners can advertise their houses. It is worth a look. Click here for more information about house sitting.